Instability Training: Should YOU be doing it? Have you ever seen someone performing squats on a stability ball? Do you wonder why your fellow gym-goer is lifting weights while standing on a bosu? Instability training involves performing exercises on an unstable surface with the goal of increasing balance while strengthening stabilizer muscles. But how effective is this training mode in increasing power and improving strength? According to a CSEP position stand by David G. Behm and co., training on unstable surfaces has pros and cons for all training levels. See below for a brief summary and check out the full paper here. Athletes: incorporate into the “rest” period of a periodized training plan to stimulate high muscle activation. However, instability training can impair absolute strength and power gains therefore should be avoided when these are the primary training goals in a sport program. 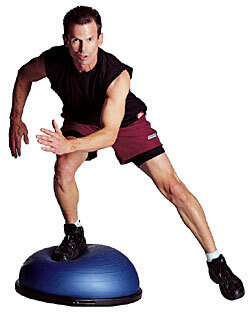 Rehabilitation: can decrease lower back pain and increase strength gains in ankle and knee joints. Recommended as part of a prehabilitation or rehabilitation program. General Population: using lower loads on unstable surfaces can produce health benefits, however should be limited if absolute strength or hypertrophy are the primary goals. Conclusion: ground-based free-weight training can provide sufficient instability and is recommended for maximal or near maximal force and power. Instability training can be incorporated for stabilizing and strengthening and is recommended as prehabilitation as part of a well rounded workout routine.